What’s Behind the Celebrity Headphone Business Movement? *It’s atypical that anyone in the music industry could stay relevant for three decades having only released two official solo studio albums-but yet, Dr. Dre has seemed to do exactly that, ironically, while sometimes staying behind the scenes. Though he’s been busy over the years launching the careers of superstars Eminem and 50 Cent, and producing hit tracks for various artists, beat making isn’t the only stream of income that keeps him making deposits at the bank. Unlike other big names in hip-hop who have dabbled in business ventures involving clothes, shoes and sneakers, alcohol and perfume, Dr. Dre has scored big simply due to a set of headphones. Beats by Dre-which was created by Dr. Dre and Interscope Geffen A&M Record’s chairman Jimmy Iovine, and manufactured and distributed by Monster Cable Products-was released in 2008 with the original “Studio” headphones. Since then, Beats by Dre has expanded into an audio products line complete with six over-ear headphones, six in-ear headphones, and an artist series, for which, Dr. Dre and Monster collaborated with figures in music, fashion and sports, such as Diddy (DiddyBeats), Lady Gaga (HeartBeats), Justin Bieber (JustBeats) and Lebron James (PowerBeats). There’s also the compact and portable speaker, BeatBox, and 15 notebook PCs, which were developed by Beats Electronics, LLC and Hewlett-Packard. Retail costs anywhere from $119.95 for the iBeats in-ear headphones to $449.95 for the BeatBox and Pro headphones. 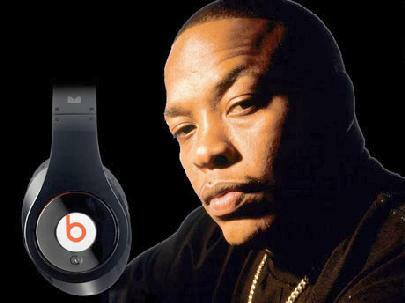 The marketing strategy is simple: Dr. Dre wants people to hear the music the way that he does. According to Iovine, its not exactly low album sales and digital downloads that are killing the music industry, but bad sound. He explained to the Financial Times that the sound that artists and producers work hard to perfect in the studio gets lost after it is compressed in order to be copied on to a CD. The sound is further compressed into an MP3 file format so it is compatible for use on a computer or mobile phone. Read the rest of this article by Brittany Hutson at The Atlanta Post.